urn on the Christmas lights with "A Holiday Gathering" Heirloom Porcelain music box by Thomas Kinkade. This three dimensional illuminated music box is a beautiful welcoming Queen Anne Victorian house, all decorated and lit for Christmas. It is hand-painted and perfect in every detail from roof shingles to the snow-covered tree outside. It stands atop a music box crafted of precious triple fired Heirloom porcelain. 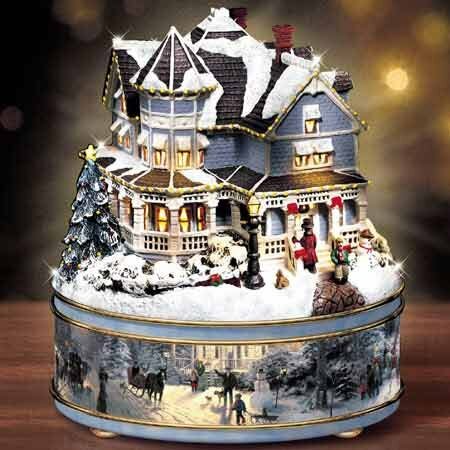 The sides of the base are adorned with a panorama of Thomas Kinkade's cheerful holiday street scenes and richly rimmed with precious 22K gold. The eighteen-note musical movement plays "I'll Be Home for Christmas". Beneath the lid is a small switch that illuminates the house from within.